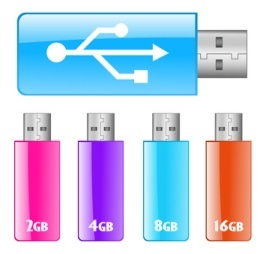 A flash usb drive is also referred to by several other names. Examples are usb memory stick, usb pen drive, flash memory drive, flash memory stick, etc. Basically, this device uses flash technology to store data. Flash memory devices store data in many semi-conductor memory chips. The movement of electrons in tiny transistor circuits in these chips determines whether the digital bit is a 1 or 0 and a series of these integrated circuits construct the digital code for the information that is being stored. Flash technology has been used for many years in computers, but more recently flash memory has caught on as an everyday storage medium. The reason for its surge in popularity is due to the small size, ease of use, quick read and write times, and large storage capacity. The only current downside is the cost. When you consider price per GB, flash memory storage is much more expensive that other storage options such as hard drives, CDs, or DVDs. Despite the higher cost the other factors provide good benefits and flash memory is being used to transfer data from one device to another and to store data. A flash usb drive is one of several types of flash memory devices. Other examples of flash memory storage device include Compact Flash cards, SD cards, SDHC cards, microSD cards, microSDHC cards, etc. Many of the flash card formats are used in electronic devices such as digital cameras, digital camcorders, and cell phones. A usb pen drive or usb memory stick is used primary with computers. By simply inserting the flash usb drive into the usb port of the computer, this flash memory device can be used. Is this type of storage device suitable for storing digital scrapbooking projects or any other type of digital information? For the transfer of information from one computer to another, the usb flash drive works well and is very convenient. For the long term storage of information, there is not much real life experience or scientific testing to determine what happens to information stored on these flash devices in the long term. Some information on the proper storage of usb drives is provided below. USB memory sticks do appear to be very durable and can withstand a variety of adverse conditions. This is especially true if usb stick drives with a fortified exterior shell are purchased. Therefore, the first tip if using this type of media for long term storage is to purchase the media with a very rugged exterior case. The most vulnerable part of the usb flash drive is the connection. When using the usb drive, be careful when inserting it into the usb port. Ensure that you have the correct orientation and do not try to force it into the usb port. When not in use, the connection interface should be protected. This can be done in several ways depending on the brand of flash drive and type of exterior shell. For example, a cap can be placed on the connection to protect it or in other situations the actual connection can be retracted into the body of the usb flash drive. When the flash usb drive is not being used it should not be left in the usb port of the computer. If left in the port without being disconnected then the pen drive will communicate with the computer on a regular basis and this wears out the media. When removing the flash drive from the usb port it should be properly ejected from the computer by right clicking on the usb icon and selecting the disconnect usb drive option. These storage conditions are very broad and quite extreme. The media may survive these conditions in the short term, but for long term storage it is best to be a little more conservative. In general, avoid very hot or very cold temperatures. More specifically, store flash usb drives in the 18 degrees Celsius to 23 degrees Celsius range most of the time. For relative humidity, keep the level between 20 to 50 percent.